WONDERFUL simplicity and spirit of compunction were the distinguishing virtues of this holy man. 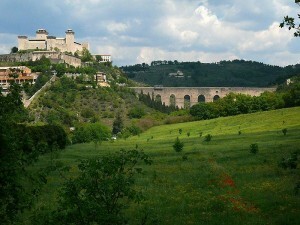 He was chosen abbot of St. Mark’s near Spoleto, Italy (see photo) and favored by God with the gift of miracles. A child who was possessed by the devil, being delivered by being educated in his monastery, the abbot said one day: “Since the child is among the servants of God, the devil dares not approach him.” These words seemed to savor of vanity, and thereupon the devil again entered and tormented the child. Abbot Eleutherius humbly confessed his fault, and fasted and prayed with his whole community till the child was again freed from the tyranny of the fiend. St. Gregory the Great not being able to fast on Easter-eve on account of extreme weakness, engaged this Saint to go with him to the church of St. Andrew’s and put up his prayers to God for his health, that he might join the faithful in that solemn practice of penance. Eleutherius prayed with many tears, and the Pope, coming out of the church, found his breast suddenly strengthened, so that he was enabled to perform the fast as he desired. On another occasion, St. Eleutherius raised a dead man to life. Resigning his abbacy, he died in St. Andrew’s monastery in Rome, about the year 585.